Land Rover Discovery 2012 review | What Car? What is it? 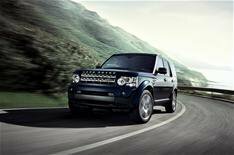 Updates to the Land Rover Discovery for 2012 include a more-efficient engine and a new eight-speed automatic gearbox. CO2 emissions for the 3.0-litre V6 diesel fall from 244g/km to 230g/km. While that doesn't affect the amount you'll pay in company car tax, average economy improves by 1.7mpg, rising to 32.1mpg. What's it like to drive? Despite the Discovery weighing the best part of two-and-a-half tonnes, the engine gets the car up to speed with ease. The Discovery remains composed through bends and is supremely comfortable on the motorway. As you'd expect of a Land Rover, its off-road capabilities are tremendous. What's it like inside? In a word, luxurious. That could be said for the current version, too. Changes to the 2012 Discovery are kept to a minimum. The touch-screen graphics and the stereo have been upgraded. Eagle-eyed Discovery aficionados will notice that the indictor and wiper stalks on the steering column have been tweaked and the key fob is smaller more 'pocket' friendly, says Land Rover. Should I buy one? Prices have gone up by between 450 and 1250 and start at 37,995. The Discovery is up against top-quality competition from rivals Audi and BMW and, despite the Discovery's efficiency improvements, a similarly powered X5 has much lower CO2 emissions. Still, there are few cars that can match the Discovery's range of talents motorway cruiser, family hold-all, premium exec and awesome off-roader. If you're after that kind of multi-tasker, the Discovery remains your best bet.